A 19th-century artist’s rendering of the public hangings of Lount and Matthews, Toronto, April 12, 1838 (public domain). This coming Friday, April 12, 2013 will mark the 175th anniversary of the hanging of Samuel Lount and Peter Matthews in what is now downtown Toronto, for their roles in the Upper Canada Rebellion of 1837. The rebellion was a reaction to the unresponsiveness of the colonial oligarchy of the day to demands for democratic reform (or what the appointed lieutenant governor called “soiling the empire by the introduction of democracy”). The events in Upper Canada or present-day Ontario paralleled a more aggressive rising in predominantly French-speaking Lower Canada, or present-day Quebec. Government forces were able to suppress the Upper Canada Rebellion. But popular objections to the autocratic rule of the “Family Compact” oligarchy remained. The authorities saw the public execution of Lount and Matthews as a warning and a deterrent to further acts of dissent. 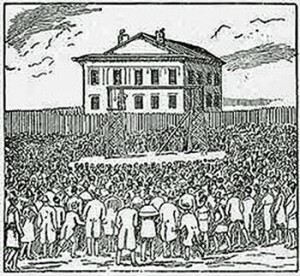 The large crowd which assembled on the morning of the hanging was testament to the public stature of Lount and Matthews. One report claimed that a petition seeking clemency for the men bore 30,000 signatures. Popular opposition to the execution drew on the two men’s reputations. Samuel Lount was a father of six and a pillar of his community. A successful farmer and blacksmith, he was seen by many as a highly capable, civic-minded man who went out of his way to help those in need (including many still very much present aboriginal peoples). He formed the Simcoe County political union which acted with other unions to support the Upper Canada reform movement. He was convinced to run for a seat in the Legislative Assembly in 1834 and won handily. Peter Matthews was a hard-working farmer from Pickering and the father of eight. He was also a civic-minded supporter of the reform movement. He was tall, stout, and strong, and had served in a militia under General Issac Brock during the War of 1812. The Lount and Matthews Commemoration Committee was formed in 2012 to raise public awareness of the sacrifices of Lount and Matthews. More broadly, the Committee is concerned to raise awareness of the Rebellion of 1837 and its role in what the historian Jeffrey McNairn has called “Upper Canada’s emergence into the liberal democracy of the nineteenth century.” We are ultimately concerned to highlight some earlier roots of what our Constitution Act, 1982 calls the “free and democratic society” in Canada today. While the rebellion itself was a modest military event, the motives of its key participants provide an entry point to a meaningful examination of its objectives and legacy. The Commemoration Committee’s inaugural event was a vigil held on the morning of Thursday, April 12, 2012, at the site where the execution of Lount and Matthews had taken place 174 years before. The gathering so early in the morning was small but enthusiastic. It lasted about half an hour and has been digitally preserved at http://www.youtube.com/watch?v=4DJc5fGrMcU. This year for the 175th anniversary of the Lount and Matthews executions a Commemoration Salon will be held on Friday, April 12 at the Gladstone Gallery in the Gladstone Hotel, 1214 Queen Street West, Toronto, from 7 pm to 11 pm. Participants will be able to meet in a relaxed atmosphere and talk with others interested in Lount and Matthews, the rebellions of 1837–38, and the Canadian democratic heritage. From 8:30 to 9:30 there will be brief presentations, including a sketch on “rebel voices” by noted William Lyon Mackenzie King actor Sean McCann, a musical tribute to Lount and Matthews from Toronto modern jazz artist Wally Brooker, a tribute to the late great civil rights lawyer Charles Roach, and a memorial on the vagaries of the 1837 rebellion at Toronto city hall by former City Councillor Tony O’Donohue. A smaller open-air vigil will also be held between 7:45 and 8:15 AM, on the morning of April 12, at the site where Lount and Matthews were executed, at the corner of Court and Toronto streets in downtown Toronto. All are more than welcome at the Salon and the Vigil. No cover charge. For more information contact lountandmatthews@gmail.com. Ashok Charles is a Toronto democratic reform activist, who has been studying the life and times of Samuel Lount and Peter Matthews for several years. Randall White is the author of several books on Canadian history and politics, including Ontario 1610-1985 and Ontario Since 1985.